When it comes to kids and color, more is better! 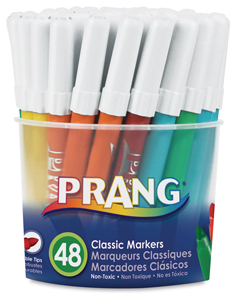 And Prang gives kids more colors and more choices than ever before. 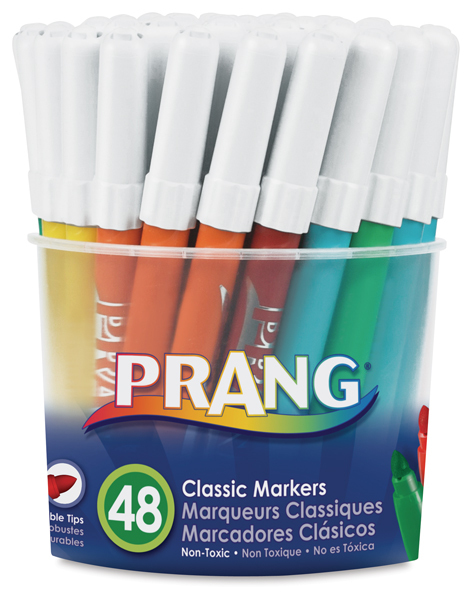 Great for classrooms, this economical tub of Prang Classic Bullet Tip Art Markers contains four each of 12 colors, including Red, Black, Yellow, Green, Orange, Blue, Pink, Gray, Purple, Light Green, Light Blue, and Brown — 48 markers in all. The markers contain superior, bleedproof ink that lays down color smoothly and easily. Their durable 2 mm bullet tips make fine and broad lines. Ventilated caps for safety and a 24-hour cap-off time make this handy tub of markers a classroom essential.